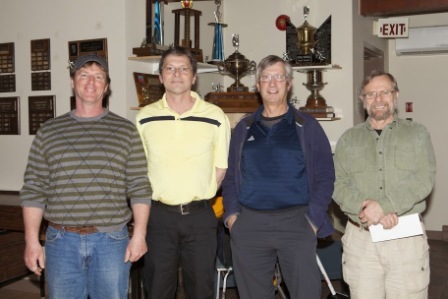 Congratulations to all of our PSCC curlers who made it to the Provincial championships this season. Our Senior mixed team finished 2nd in the entire province! Way to go team Jennings! 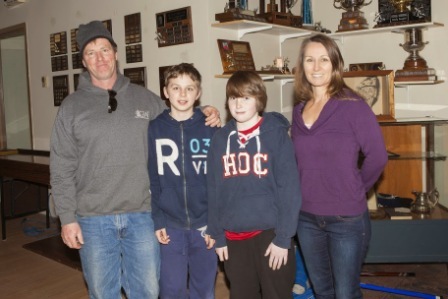 Tyler and Mackenzie Marshall finished 4th in Ontario curling with Emma Clendenan of Port Carling! Liam Thompson's team had some close losses and finished with a 2-5 record! Fantastic job everyone! We are very proud of you. Laura Thompson (coach), Adam Walker (second), skip Liam Thompson. 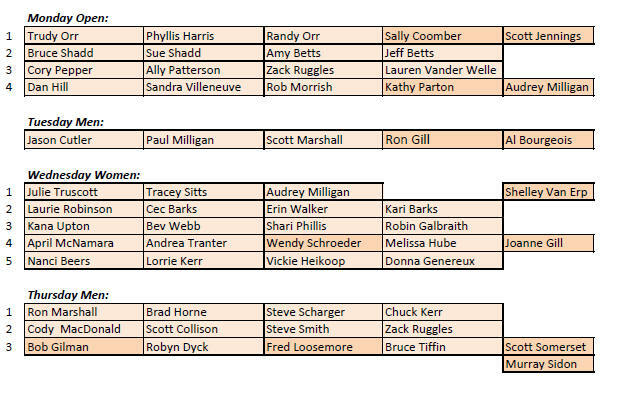 Congratulations to our new club champions! 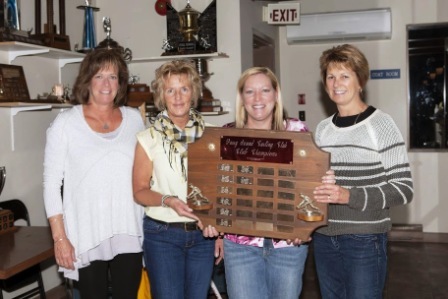 It was a very good year for the women's teams in the Club Championship. 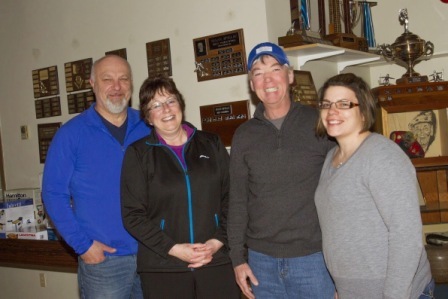 Laurie Robinson's team defeated Julie Truscott's team in the Main Event final to become the 2015 Club Champions. Congratulations to both women's teams! 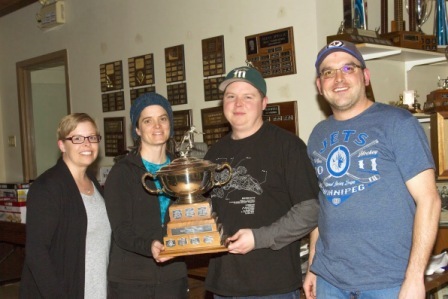 In the consolation final it was April McNamara (Gill's Wed. night team) who defeated Ron Marshall in a very close game. April's last run-back take-out was the game winner. What a fantastic shot! Both the second and third events were tied after 8 ends - and in a shoot-out for each, both skips put rocks on the button or very close to it. How exciting to watch! Winner of the second event was Cody MacDonald's Thursday night team defeating Bob Gilman (Scott Somerset's Thursday night team). 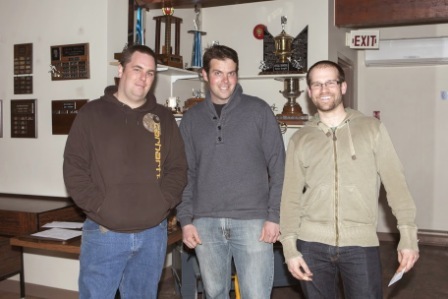 The third event was won by Jason Cutler (Al Bourgois' Tuesday night team) over Bruce Shadd's Monday night team. Congratulations to all of the competitors and the winners and runners-up in each event. Well done all! Bob won his award for the time and effort he puts into taking all of those wonderful photos at bonspiels etc. 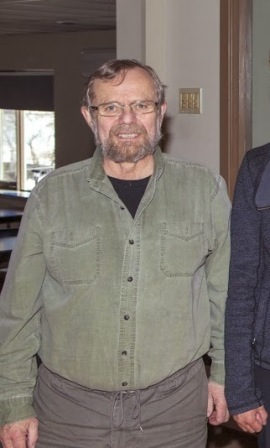 Ray won his award for all of the things he has done for the club, Timbits and junior curling in general. 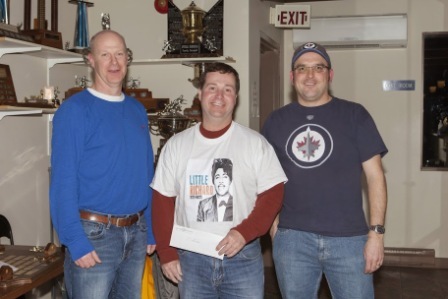 Also for his work this past season on the 2-4 Supporting our Troops Bonspiel. The Parry Sound High School girls curling team of Nicole Heikoop, Ashlyn Simpson, Arden Milligan and Elizabeth Edington travelled to OFSAA March 9-12 in Trenton/Brighton and Stirling. They won all four games in their round robin play going 4-0. In the quarter finals they played Walkerton Secondary School and won 8-4. Although they were unsuccessful in the semi finals and finals, they finished fourth in the Province and represented the school and club very well. An amazing accomplishment by the team- congratulations! 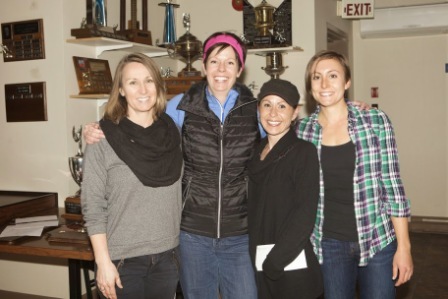 Pictured wearing their antique bronze medals: Julie Truscott (coach), Elizabeth Edington, Arden Milligan, Ashlyn Simpson and skip Nicole Heikoop. 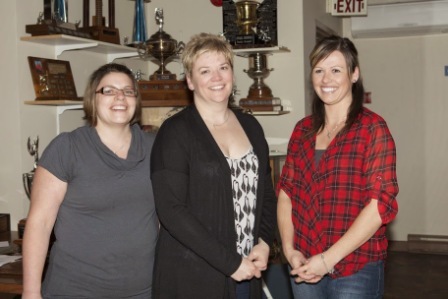 For further news regarding our young curlers, see the Youth Curling Page. 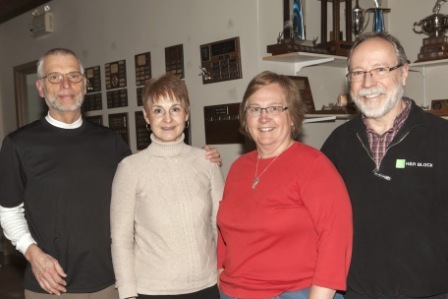 Go to the photo gallery page and click on the link for some photos from the Friends and Family Spiel 2015.